What are large format thermometers? 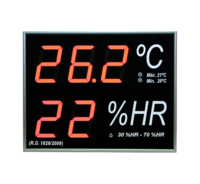 They are simply large thermometers, usually digital, that are placed in public areas and allow to see the temperature and humidity information from great distances. These large or large format thermometers are mandatory in commercial spaces or enclosed spaces and their use is regulated by Royal Decree R.D. 1826/2009. 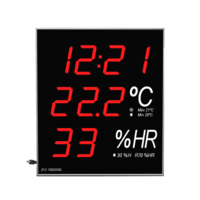 Its main feature is that its numbers are large and can be easily seen from anywhere in the room where it is installed. 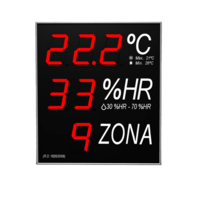 Further, the possible combinations are extended, since a large-format thermometer can be manufactured practically to the user's needs. What different options does a large-format thermometer have? 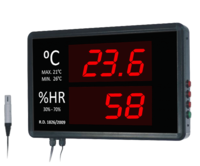 This type of large format digital thermometers have a large number of options. They can include external probes or internal sensors, or both simultaneously. It is also possible to measure the humidity or show the time. There are some that measure and show the temperature of several zones, so their use is more industrial. 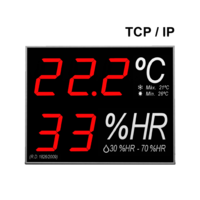 There is also the option of the thermometer transmitting the data to a computer or database.